Kemp sometimes struggles to explain the underlying concepts: she calls it a "board game" while stressing that it "is not played on a regular game board with standard game pieces but on a blank chart that is mapped as the game progresses." She understands that it is a "modified war game," though she perhaps misunderstands how closely the game follows the stories of Tolkien, as she suggests players "create a type of 'history continuation' of Tolkien's stories and implement their own ideas along the way." Similarly, she has the impression that you had to consult the supplements for content beyond the setting of Tolkien, like the medusa or various medieval characters. 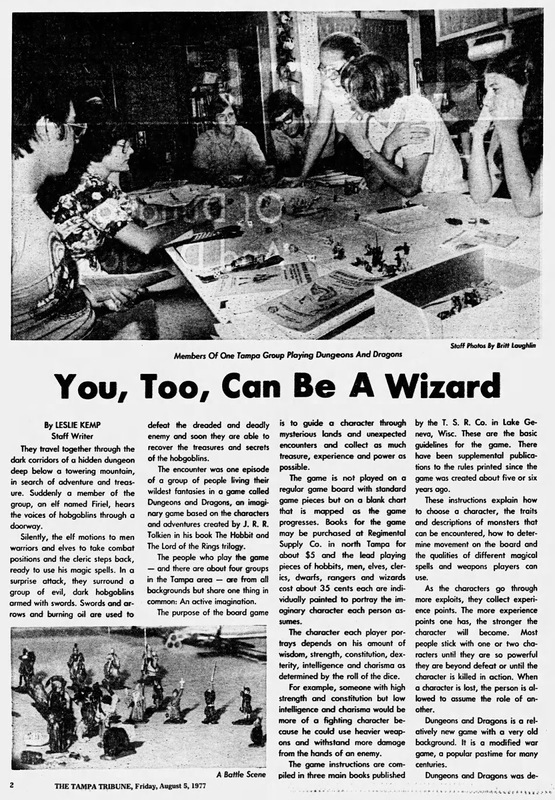 But she explains the basic mechanics well enough to intrigue someone unfamiliar with the game--at the time, that is virtually everyone who would have read this piece. 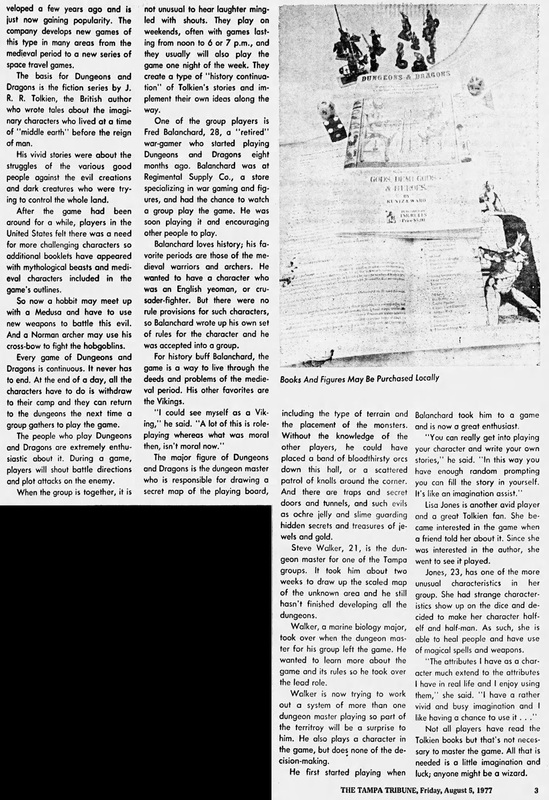 The photographs accompanying the article show OD&D in full use: we see white box booklets on the table in the first picture, and in another, a copy of Gods, Demi-gods and Heroes is lain across a few pages of Eldritch Wizardry. The dice visible are Creative Publications polyhedra, except for the six siders, most of which are pipped dice. Kemp is careful to emphasize that "books and figures may be purchased locally," and she repeatedly mentions the Regimental Supply Room as the local dealer. The three players interviewed are all over twenty years old, which does stand apart from later press focusing on teenage players. One of the three is female, and indeed the photograph of play around the table (if the grainy reproduction here doesn't mislead us) shows two women out of seven players present. Lisa Jones explains to Kemp, "I have a rather vivid and busy imagination and I like having a chance to use it." Kemp knows that it is being put to good use: she reports on groups convening regularly on weekends and one weeknight, where "it is not unusual to hear laughter mingled with shouts." Great to see this. Maybe the local players who explained the game to her were doing a Tolkien continuation with Medusas.